Today, Environment America Research & Policy Center announced the launch of a monthly webinar series focused on the transition to 100 percent renewable energy on college and university campuses. In October, we released a new report detailing 11 strategies and tools that universities can use to move towards meeting 100 percent of their energy needs with renewable sources. 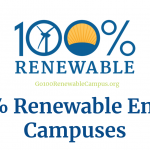 Renewable Energy 101: Tools for Moving Your Campus to 100 Percent Clean Energy is a series of factsheets highlighting key tools colleges can use to start building a 100 percent clean, renewable energy-powered system. In this monthly webinar series, we will be joined by campus and energy experts to highlight the strategies and tools that colleges and universities can employ in the transition as well as the progress made by campuses across the country. We will bring together sustainability directors as well as sustainability-focused college and university faculty and staff to share best practices and accelerate the transition to clean, renewable energy sources.